Tetris 99 | Cinder Inc.
Good god I didn’t expect to enjoy or keep coming back to this game as often as I have been, but it’s really a fantastic little pick up and play for a few rounds before moving on with your day! 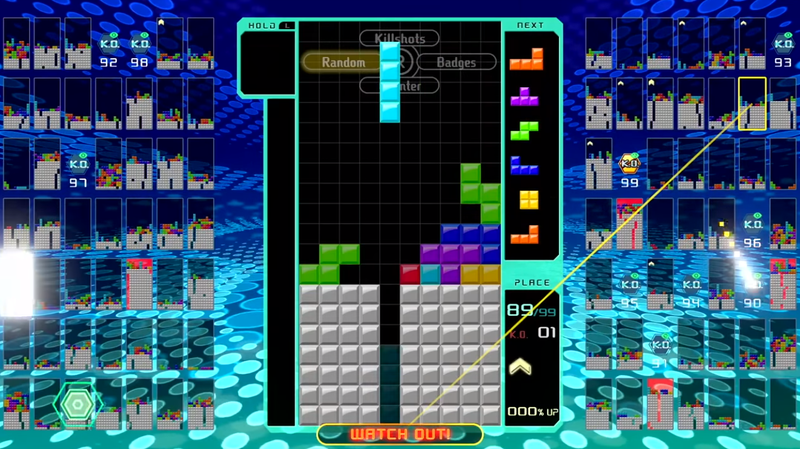 For those that don’t know, Tetris 99 was a little gift from the Nintendo gods and the Tetris Company last month out of the blue. It’s a 99 player version of competitive Tetris, where one by one your opponents are defeated and hopefully you’re the last one standing. Who would have thought Tetris 99 aka Tetris Battle Royale would work so well, but rounds last maybe 5-10 minutes if you’re good, less if you have a bad run, or just aren’t so good. Initially the game is pretty opaque and anemic with options, but you quickly realize you don’t need a lot of options or selections or hints or rules when you’re playing multiplayer Tetris. Rule 1. Don’t Die. Rule 2. Send more lines to your opponents than they send to you. Rule 3. If you mess up on Rule 2, see Rule 1. I’ve managed a 3rd place finish only once, and only been in the top 10 one other time. I’m usually happy with a teens finish, but from round to round I’ve been all over the map. I also neglected to mention – it’s free. Honestly if you have a Nintendo Switch it’s worth the quick download and play.